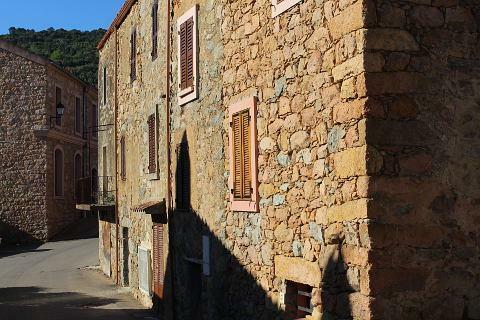 Piana is a pretty village set in and overlooking the fabulous Calanqes de Piana; one of the most beautiful parts of Corsica. 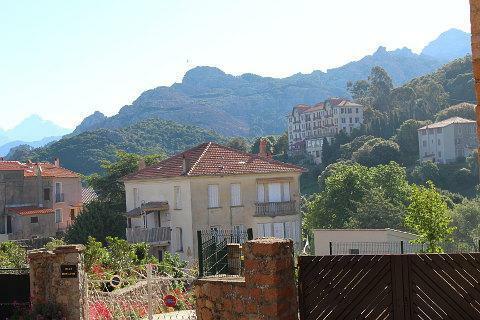 The village is about 11km from Porto, along the D81 calanques road. 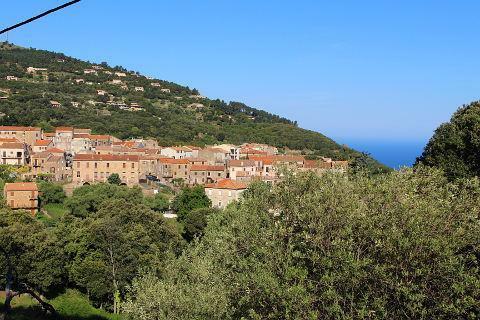 Piana is listed as one of the most beautiful villages of France though in truth its appeal is in its fabulous location overlooking the Golfe de Porto rather than the village itself. The village whilst pleasant is not particularly exciting. 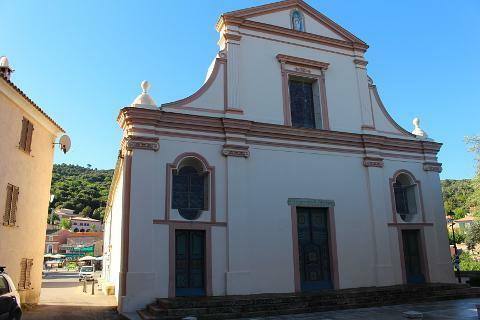 The main historic site is the Baroque church of the village which has a tall square bell tower and inside there are some frescos and paintings by Paul Mathieu Novellini in a style which is typically Corsican. 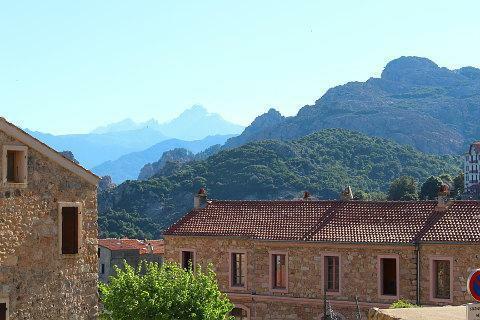 All around the village are fabulous views of the surrounding mountains and also sweeping views over the Golfe de Porto and the red cliffs of the calanques. These make the village a lovely space to stop and there is a little shop, bar and restaurant allowing you to stay and savour the views. We visited in May when the village was quiet but even then coaches were arriving and departing. 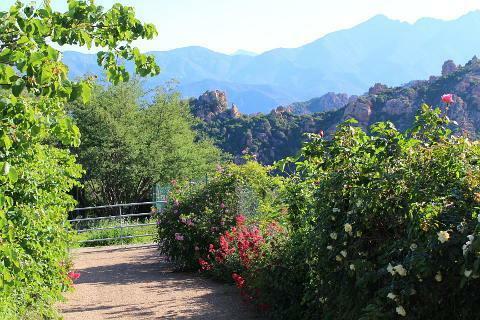 Piana is much busier in July and August as is the Calanches road. It is probably best to arrive early morning, or even better, early evening when you can enjoy sunsets over the gulf of Porto as you drive back. The road between Piana and porto along the stunning Calanches is one of the most beautiful drives in Europe. Another way to visit the Calanches is by boat. Another popular boat trip is a visit to the Scandola Nature Reserve. Corsica has a number of stunning beaches and one of these is Arone beach about 15km from Piana to the south-west. Arone beach is a large sandy beach with a large shallow stretch of water making it great for children. 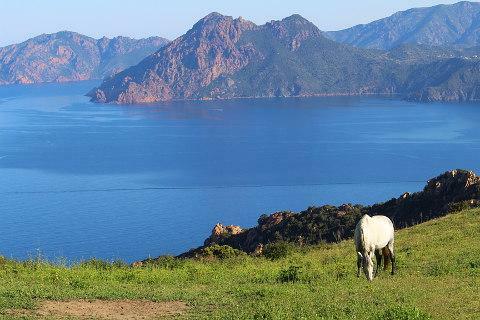 The sea is that beautiful mix of green, blue and turquoise you get on some Corsican beaches and surrounding the bay is a backdrop of green hills and mountains.